OK, it's Friday, you are done with cooking for the week, but don't want to pay for take-out. Falafels are a super simple and healthy way to finish out the week. This isn't a recipe I really ever considered posting, but it's such a staple in our house and it's been asked for so many times, I thought it was time. These little guys are fried in a touch of olive oil, and are best served over salad or stuffed into a pita, both ways with lots of hummus. Keep it simple. The original recipe calls for a yogurt sauce, etc, but for me at lunchtime or looking for a quick dinner, that's too much. The best thing about these, however, is that you probably have nearly everything in your pantry and fridge on most occasions to make these. Chick peas are a staple in our pantry, they're super versatile. Combine all ingredients, except olive oil, in a food processor and process until smooth. Now, form whatever sized patties you like. I usually get about eight out of this recipe. Heat tablespoon of olive oil over medium-high heat, and fry the patties. 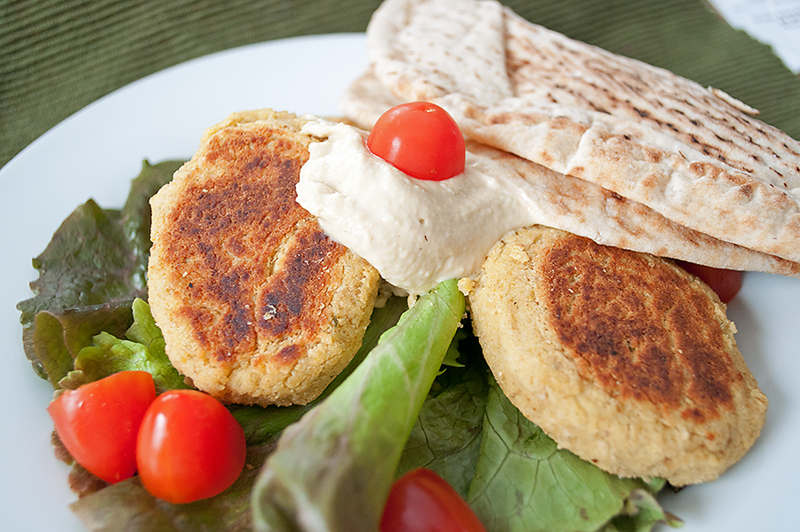 Serve with lettuce, hummus and whatever other veggies you might like! I've also been kindly asked to be part of the North Shore Bloggers Consortium, a group of talented local bloggers. Every week I'll be bringing you some of what I think are the best things to check out in our area for the upcoming weekend. Please check out the picks of the other bloggers below as well and plan out your weekend supporting local people and events! If you love yourself a little bit of the Piano Man - Blue Ocean Music Hall in Salisbury, MA has "Big Shot - a Tribute to Billy Joel" tonight. BIG SHOT, featuring the amazing vocals and piano of Michael DelGuidice, a well known and respected Long Island multi-instrumentalist. The show is packed with hit after chart-topping hit in a high energy, interactive stage performance. Seacoast Eat Local has done an amazing job with Seacoast NH Winter Farmers' Markets this year. From meat, to veggies, to ready-made foods, to tea and even wine - these markets are packed with amazing local goodies. Next month, on 2/26 they also "CSA Day" where you can chat with local farmers about joining their Community Supported Agriculture programs this spring and summer. You invest in their farm, and every week you get a wealth of yummy produce. 50 Water Street, The Tannery, Mill #1, suite 5, Newburyport, Massachusetts. Tickets are $18.00 adults; $15.00 students and seniors. Please reserve in advance by calling 978-465-1229 . The Actors Studio of Newburyport presents Primal Polyphony in a matinee concert on Sunday, January 30th, at 3:00 pm. Primal Polyphony will donate back 100% of their proceeds from this performance to promote further the great work of the Studio in the community. Now in their ninth year, this trio’s performances have won them acclaim from Boston to Philadelphia, across New Hampshire to Vermont and western Massachusetts. The members are Wilhelmina Bradley, soprano; Annie Philips, mezzo-soprano; and Charles Bradley, tenor. Check out Joey C’s Picks on Good Morning Gloucester here. The Falafel look delicious. I love them. Great North Shore suggestions too. Thanks! Am looking forward to learning more about what's going on north of the city, I don't get up there nearly as much as I should! Thanks for the shout-out for the Seacoast Eat Local Winter Farmers' Markets — we'll be in Exeter on February 12th, and CSA Day in Rollinsford will be on Saturday, February 26th! The Falafel looks so good. You have a great blog and I am glad I found it! I made "healthy" falafel this weekend, but these look so much better! I'm glad I found your blog today - I am definitely going to try this recipe the next time my falafel craving hits!